STRANGE FACTS - Nutty Facts. Weird Facts. Interesting Facts. On June 4, 1923, jockey Frank Hayes took off through the gates at Belmont Park on Long Island. He and his horse, Sweet Kiss, made it to the finish line first. But all was not well. During the race, Hayes had a heart attack and died. Nonetheless, he was declared the winner. 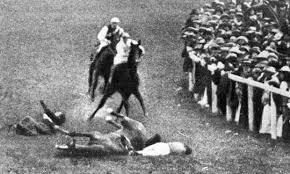 When the horse crossed the finish line it became quite evident that Frank Hayes was more than just “relaxed”- the jockey dropped out of the saddle, lifeless. It was later determined that Hayes had died of heart failure shortly after Sweet Kiss took the lead, and the New York Times speculated that the jockey’s heart had given out as a result of severe training in order to make weight, coupled with the excitement of winning his first race. Hayes, dressed in his colorful racing silks, was buried three days later. In light of the incident, Belmont’s Jockey Club waived all of the rules and thus made Hayes’ win official. This ruling makes Frank Hayes the only jockey to win a race while deceased. In fact, it is the only time in sports history when a competition was won by a dead man. The hanging of seven-year-old Michael Hammond and his 11-year-old sister, Ann.